We know it can be difficult or intimidating to step into a gym for lifting, so we've rounded up seven great arm workouts without weights that you can do almost anywhere. Get arms like Cameron Diaz, J-Lo or Zoe Saldana with no equipment necessary! Keep reading to find out exactly what to do. 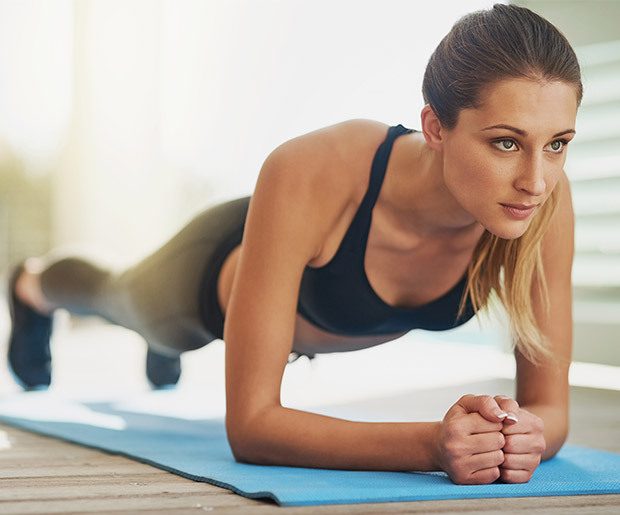 Although it's probably not high on your list of favorite exercises, there's a reason the push-up is a mainstay in many workout routines: It's highly effective when done properly. Begin in a high plank position, making sure your hands are directly under your shoulders. Lower your body to the ground by bending your elbows. Always keep your back flat rather than letting your pelvis sink too low or your booty raise too high. Push through your palms to get back up into a plank position. You can always modify the push-up by starting on your knees and working your way to your feet. Or, for more a challenge, try diamond or wide-arm variations of push-ups. Push-ups are great arm workouts without weights that target your triceps and shoulders as well as chest muscles. This is one of few arm exercises without weights that can be done using a chair, sofa, bed, box or step, so you'll be ready to go no matter where you are. Sit on the ground with your back up against whatever you've decided to use and your legs stretched out in front of you. Fingers facing toward you, place your hands palms-down on the item behind you. Lift yourself off the ground by straightening your arms, and then dip back down again by bending your elbows. Your elbows should always bend directly behind you into a 90-degree angle. These are perfect for working your triceps, biceps, deltoids, upper back and parts of your chest. Planks on their own are excellent arm workouts without weights, but we prefer to mix things up a bit. Start in a high plank with hands below your shoulders and your feet together. Jump your feet out and then back in much like you would if you were doing a jumping jack. Plank jacks really target your shoulders, so get those spaghetti straps ready! As an added bonus, they're great for working out your core. Just remember to keep your abs pulled in tight so that your body remains in a straight line. This second plank variation is no joke! Begin in a high plank position. From there, lower yourself into an elbow plank one arm at a time. Lower your right elbow to the ground first, and then your left. Next, put your right hand back on the ground and straighten your right arm. Do the same with your left arm to raise back into a high plank. Continue this, alternating arms each time so you get a nice, even workout. Always make sure to keep your abs tight and your back straight so that your hips don't sway as you switch positions. We're sure you'll be feeling this one in your biceps, triceps, shoulders and wrists. You may be wondering what good these particular arm workouts without weights could possibly be, but we promise, this Pilates move works! Stand up straight with your arms stretched out in front of you, palms up. Curl your hands into loose fists like you would when holding actual weights. Bring your fists up so that your knuckles touch your shoulders. Hold here for a moment, squeezing your bicep muscles, before slowly extending your arms back out in front of you. Repeating this slow, controlled movements works your biceps and shoulders along with your back muscles. This is another Pilates arm workout that requires no equipment. Standing with your feet hip-width apart, bend your knees slightly and bend forward at the waist. Let your arms hang down in front of you toward the floor, shoulders down. Pull your elbows up at your sides until you're squeezing your shoulder blades together. Hold here and engage your triceps muscles for a second, and then lower your arms back down in front of you. You'll love how toned your triceps, shoulders and upper back start to look after doing this move consistently. Sitting comfortably on the floor, back straight, bend your arms at a 90-degree angle in front of your face. Put your hands together as if you were praying, and then push your forearms together as well. Begin with your elbows at shoulder height. Raise your arms about 3 to 4 inches, and then lower them back down to starting position. Continue this movement for as many reps as you can in a minute. You'll feel the burn in your biceps, shoulders and chest.